← Who Do Voodoo? You Do! Or at least, Lee does. Often associated with the distress when a vessel or vehicle is in trouble, the call “mayday! mayday! mayday!” derives from the French word m’aider which means “come help me.” Lesser known is the call “pan-pan, pan-pan, pan-pan!” which means there is an urgent situation on board. Though one may think it is a derivation of the word panic it actually comes from the French word panne which refers to mechanical failure or breakdown of any kind. But May Day is so much more than a distress call. May Day celebrations exist throughout the world, but are especially prominent in the U.K. and Western Europe. In England and Scotland the celebrations around or near May 1st relate directly to the pagan Beltane (in Ireland Bealtaine) and are associated with the Rites of Spring—specifically fertility. The celebration of new life and birth at the time of year when the land is waking up, flowers pushing through the sodden hills, still takes place today with the crowning of the May Queen and the erecting of the may pole. (You don’t have to be a genius to figure out what a giant pole in the middle of a lush field wrapped in beautiful ribbons represents.) Bonfires are lit, merry is made. Prominent also in Germany, Walpurgisnacht (Witches Night!) celebrations are usually held on the Eve O’ May: bonfires and the wrapping of the Maibaum—the may pole—are included along with dancing, drinking and general MAYHEM! Finns make special donuts and lemonade to mark the occasion. Many early immigrants from Germany and England as well as other parts of Europe such as France and the Netherlands continued their traditional celebrations in the settlements of Early America. Without the community and established towns of Old Europe their traditions were often more family based and including the weaving of May Baskets and the giving of flowers. If you read this collection of short stories by Charles Montgomery Skinner, which includes the title work The May-Pole of Merrymount, you will gain a bit more insight into how some of these wild nights of fun and mayhem were translated into Puritan settlements of America. A downer? Yeah, a little. But worthy of a May Day read. Plus there are freaky stories of witches and old creepy men in caves that you probably shouldn’t think about, but can’t help yourself. Charles Montgomery Skinner (1852-1907) was a native New Yorker with a literary palate as diverse as the community I grew up in. Perhaps best remembered for his work on Walt Whitman, “Whitman as Editor” which appeared in the Atlantic Monthly in 1903, his works ranged from urbanization, gardening, the economy, communism, natural history, and folklore. This excerpt from his first collection of folk tales is from the greater work Myths and Legends of Our Own Land which was first published in 1897– a massive volume of stories from across the settled cities and wild plains of America. I have selected a few of my favorites for this collection, stories that I think represent the varied tastes of our author. 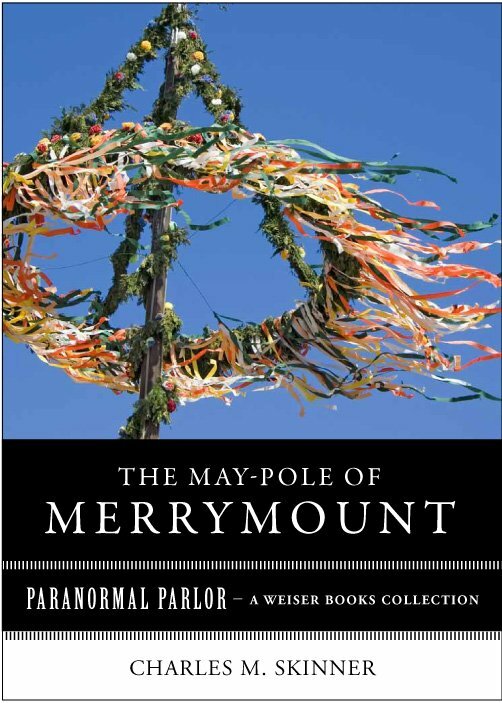 The legend of a witch in the Catskills to the Maypole of Merrymount, we find a unique view on the lore that founded the United States. Skinner also wrote Myths and Legends Beyond Our Borders and Myths and Legends of Our New Possessions and Protectorate (lands we had pillaged) both of which were published in 1899. This entry was tagged Beyond Bizarre, bizarre, freaky, magical creatures, May Day, may pole, mayday, Paranormal Parlor, The Book of the Bizarre, Varla Ventura, Walpurgisnacht, Weiser Books, Witches. Bookmark the permalink. Very great post. I just stumbled upon your blog and wanted to mention that I have truly enjoyed surfing around your weblog posts. After all I’ll be subscribing for your feed and I’m hoping you write again very soon!